Overwatch is out tomorrow (or today, depending on where you live), and Blizzard is marking the occasion with an animated short about Soldier 76. If you're not up on Overwatch's backstory, you probably know Mr. 76 as "That Call of Duty Guy" since he fights with an FPS-standard assault rifle and sprint ability on a battlefield full of chaingun robots and laser gorillas. But he's also one of the founders of the original Overwatch, a heroic association that he still can't shake years later. Honestly though, trying to get out of the hero business is a tall order when you keep running around playing gun-toting Batman. Overwatch's servers will open in a matter of hours. Why not pass the time by watching the rest of the animated shorts? There's one starring genius cyber ape Winston with a cameo by the ghostly Reaper, a second with assassin Widowmaker and the time-jamming Tracer, and a third that reunites the bow-wielding Hanzo and cyborg ninja Genji. 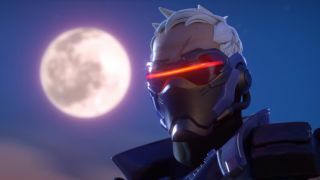 Apparently Soldier 76's "Hero" animated short is the finale to the first season of Overwatch character spotlights, but I hope we get more soon. Or at least one for my favorite explosive Australian duo, Junkrat and Roadhog.